While waiting in a line that rivaled one for a Marc Jacobs show at the New York State Armory, we chatted with Los Angeles Magazine’s Style Director, LAURIE PIKE. She tolerated the wait and crowd because she was “curious and amazed that there would be a turn out of this magnitude for a TV star turned fashion designer”. While we never made it inside the venue [the Fire Marshal shut out over 50 of us still waiting at the door] we did get a commentary from veteran photographer, Fashion Wire Press’ ED KAVISCHE. He shrugged and remarked, “Cheap Sportswear”. Ms. Pike however gave the 22-year old Conrad’s 30 -piece collection a cautious endorsement. Her assessment, “She [Ms. Conrad] was smart, she didn’t show too many pieces and there were some nice jersey pieces.” We liked the blue strapless “Audrina” had on that Mr. Kavische showed us on his camera that an editor in line said Ms. Conrad had designed for her “Hills” gal pal. XUBAZ is a 6-pocket “functional scarf” designed by Bernt Kuhlman. This scarf is really the everything scarf. According to the press lit on our seat, “it is used in lieu of –or in addition to – jackets, coats, vests or purse.” The scarf ‘s filled with handy little zipper pouches just the right size for a cell phone, credit card and a lipstick. HOW IT LOOKED: We got a preview; A-Line’s PR’s Sofia Shershunovich was wearing a cobalt XUBAZwith LED crystals that looked fun and festive. The show kicked off with a guy and girl in matching black leather quilted motorcycle suits. 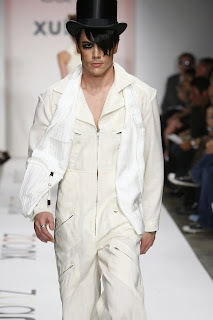 The lame looked good, especially the “Abba” jumpsuit and silver “Joan of Arc” column gown with matching silver skullcap. The spider lace dress was another high point. The XUBAZ looked equally good on the men and women. We loved it worn with a matching eighties cream parachute suit. There were some imaginative prints thrown in like a bronze and teal evil eye jacket and some over the top dresses that would be perfect for this globetrotting woman when she goes to Carnival in Rio. 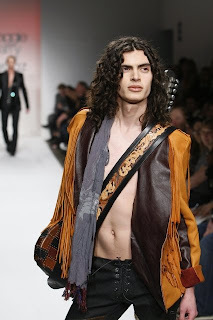 BEST MEN’S LOOK: the seventies style brown leather fringe jacket [very Jimi Hendrix] tied with the recycled army vest and parachute pant. BEST WOMEN’S LOOK: the recycled army ruched ball gown. We left wishing we had a XUBAZ to wear out that night. Big sis, Paris, sat front-row smiling and watching approvingly as the show opened with a model in a black head to toe riding outfit. There was an equestrian theme thread throughout. There was the oversize glen plaid fabric, the hardhat riding hats, riding boots and riding gloves. There were some good everyday clothes too, such as a black coatdress with an interesting texture. Like her design peers, Ms. Hilton seemed to be feeling very eighties this week. She showed black tights and leggings throughout that looked like neoprene rubber. Ms. Hilton sexed things up further with a black schoolgirl mini that was leather, not dowdy wool tartan. The terrific white sheath dress trimmed in black patent that came out appropriately, right about when Janet Jackson’s “Nasty” started. For evening, the black lace overlay tank dress trimmed in black patent, had just the right dose of naughty. The hair and makeup was perfect, the sleek stick straight pony tails by GHD and pretty face with a smoky cat eye by Smashbox Cosmetics’ Lori Taylor looked like what the young girls Ms. Hilton is targeting would wear.